Hey everybody, it's Truffles! Do you like my new "Truffles Interviews" graphic? I told Mommy that it needed a redesign to match my status as a hard-charging feline reporter, and I think she did a pretty good job! 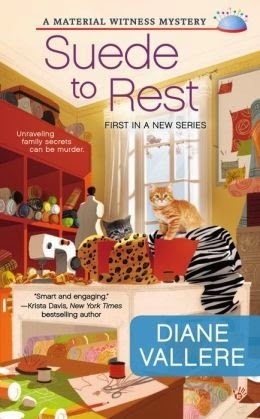 Today I'm interviewing Pins and Needles, a pair of adorable kittens from Diane Vallere's Suede to Rest, the very first Material Witness mystery. 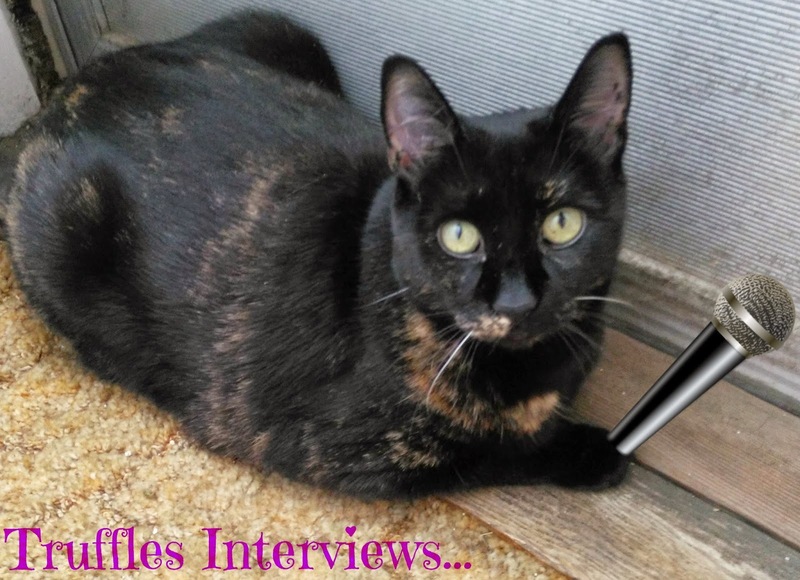 Following the interview is our Tortie Shorties review and a chance to win your own copy! Welcome, Pins & Needles, thank you so much for joining me today! Can you tell us a little about yourselves and how you came to live with Poly? Hi Truffles! I hope you don't mind if we answer together. We're still a little shaken up from being abandoned in a Dumpster behind the fabric shop. Pins: I'm a gray striped tabby, and Needles is orange striped. Needles: We're lucky that Poly wanted to take care of us, though for awhile we were scared when we heard she couldn't have pets at her apartment in Los Angeles. I have a guess as to where your cute names came from...is there a story behind them? Pins: We like to play and sometimes we forget that our claws are sharp. I think Needles stabbed Poly a few times. Needles: I think that was you, Pins! But one day Poly reached into a drawer in the fabric shop and got stabbed by a bunch of pins and needles in an open box, and, well, there you go. What is a typical day like for you little kittens? Needles: Mostly we stay together. I don't ever want to think about being separated from my brother. Especially after being left alone outside. Pins: Poly found a box for us to sleep in and lined it in fake fur. Needles: It's on the cover of the book about her! There's leopard print and zebra print and it was like sleeping in a puffy jungle. Pins: After Poly was sure we were okay, she took us upstairs to the apartment above her shop and let us roam. Nobody's lived there for a long time so there are lots of balls of dust for me to chase! Needles: There are about a hundred million giant stairs to climb to get to the apartment. I went down them once and got lost in the back of the store. I think I'm going to stay with Pins from now on. Is must be fun spending time in a fabric shop...do you have all kinds of fun things to play with (and nap on)? Pins: She'll probably drop more when she sees how much we like to play with it! Needles: There's a dark room in the back of the fabric shop. One day she left the door open and I had to see what was back there. Pins: That's the day you got lost, and when Poly found you, you were so dirty! You were the same color as me! Needles: I know, but I couldn't help myself. I am a cat, after all! What kinds of trouble do you crazy kids (and Poly) get into in Suede to Rest? Pins: Poly gets into all kinds of trouble! Needles: Nothing as bad as winding up in a Dumpster. Pins: No, but she's the one who found that body by the Dumpster. Needles: That was before we were discovered. How do you know about the body? Pins: I heard Poly talking. She's very worried about the store, and how the rich developer is pressuring her to sell it to him, and losing touch with possibly losing what her great aunt and uncle created a long time ago. Needles: Hey Pins, let's make a pact to not get into any trouble until Poly is settled. Okay? Pins: I'm a cat too! Truffles, doesn't it violate the Kitten Manifesto to make that kind of promise? Do you have any idea what your upcoming adventures are going to be? Pins: I heard Poly talking about velvet. I brushed my face up against a bolt of the stuff and it was nice and soft, so I hope she brings us lots of that. Needles: As soon as I'm big enough, I'm going to learn to go up and down those stairs really fast! And maybe try to go into that back room again. Pins: I thought that back room scared you? Needles: What can I say? I'm curious! About the book: With her career as a dress designer in shreds, Polyester Monroe is looking forward to a fresh start. But as it all unfolds, the pattern to a new beginning looks a lot like murder. before her own life is left hanging by a thread. About the author: After close to two decades working for a top luxury retailer, Diane Vallere traded fashion accessories for accessories to murder. SUEDE TO REST, the first in her new Material Witness Mystery Series, comes out November 4. In addition, she writes the Style & Error Mystery Series, featuring former fashion buyer Samantha Kidd, and the Mad for Mod Mystery Series, featuring Doris Day-loving interior decorator Madison Night. Diane started her own detective agency at age ten and has maintained a passion for shoes, clues, and clothes ever since. Find her at http://www.dianevallere.com/. Poly, (short for Polyester...she was born in her family's fabric store), has just inherited Land of A Thousand Fabrics following the death of her Uncle Marius. What was supposed to be a quick trip to sell the property to a local developer who already owns much of street takes an unexpected turn when Poly finds herself drawn to the property. It's clear from the start that someone wants her gone because when she enters the shop for the first time in years her car is vandalized. Then the one witness on the night of Poly's Aunt Millie's murder 10 years ago is found dead behind the store. Poly's potential love interest is unusual for a cozy mystery. It's not the local detective, it's the son of the developer who is pressuring Poly to sell! Can she trust him or not? Also in the picture is Poly's longtime boyfriend back home who I could not stand! I have no idea why it took Poly so long to send him packing. A wonderful cast of characters also includes the new friends that Poly makes in town, especially car mechanic Charlie and Maria Lopez, who runs a cleaning business and whose husband owns a bakery. Why does Poly feel such a strong pull to the fabric shop? What really happened to Aunt Millie 10 years ago, and how do recent events tie in to Poly's family tragedy? You'll have to pick up the first Material Witness mystery to find out! I spent a lot of time in fabric stores from the 50s-70s and still have boxes of patterns, notions, fabric and crafts squirreled away somewhere. Anyone named Polyester should have her books read! Great interview. I love mysteries with cats in them. Wonderful interview! Love your new graphic, Truffles. I have wanted to read Suede to Rest, since I first saw the cover! The kittens, Pins & Needles are precious. To be honest I can not sew, but I still enjoy fabric stores. Good interview Truffles. I love your approach to introducing the felines that are also involved in the mystery of this book. You deserve extra treats for your great job. You’ve found your calling, Truffles. Go with it. You don’t have to enter us. Used to sew all the time and made my own clothes so this book is right up my alley. Another super interview, Truffles. Pins and Needles are going to be the stars of this new series I an tell. Hi Angel, thank you for the comment! Hi Karen, I grew up around patterns, notions, and fabric too! Hope you like Polyester! Hi Bookbaba, how funny! But it sounds like practice made perfect. Hi Lisa, I think it's a cute title too! Thank you! Hi Deanna, I love puns too! Good luck with the contest! Hi Clickner, Thank you! Pins and Needles enjoyed doing the interview too! Hi Oneponychick66, I think cozies provide a great escape. Thank you! Hi Fish Crew, I had orange tabby who looked like that orange kitty too! Hi Libby, thank you! My family trained me on puns. Good luck! Hi Jamie, Thank you! Pins and Needles are two pretty awesome kittens. And Truffles is a pretty awesome interviewer too! Hi DogsMom, that's the best thing about crafting cozies, you can read about sewing but not have to do it! Hi Robin, Truffles DID do an excellent job! Pins and Needles were nervous at first, but Truffles made them very comfortable. Might have been the secret catnip. Hi Cathy, Yes, Truffles is a real pro! Hi Ronna, My mom made most of my clothes too. She still has some of them in a closet somewhere! Hope you enjoy the book! Hi Rebecca, Thank you! Hope you enjoy Suede to Rest! Hi Sue, Yes, Pins and Needles could really steal the show here. Good luck! I tried to like sewing, tried very hard. My mom is a great seamstress, moving on from clothes and doll clothes to quilting now. But I can't imagine the time she spent making all those doll clothes to give to us girls for Christmas! Anyway, I gave up trying to like sewing. This sounds like a great book! Sounds like a very interesting book. I love the names! This sounds like a great book! I loved the interview! My cat loves to bury himself in my fabrics! Thanks for the chance! that might just be the best interview, i 've ever read! Can't wait to get my paws, um, hands on a copy of Suede To Rest! You are finding all kinds of fun books! will put it in my need to read list! Thanks! This is on my "want to read" list. I'd love to get a copy so I could get started.